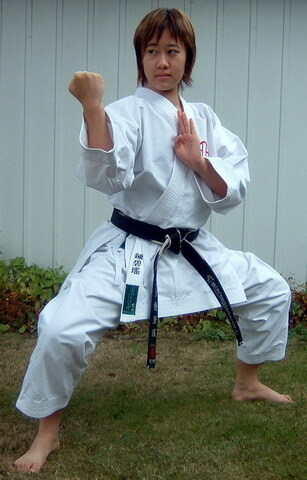 Brittany began her Karate-do training in 1998 at the age of 7. She trains in Shito Ryu Karate-do under the Seito Shito Ryu Canada Karate-do Kai, under Shihan William and Sensei Alice Chung. In 2011, Brittany earned her Sandan (3rd Degree Black Belt) from the International Shihan Kai, which consists of the Japanese Executive council, the American Shihan Kai, & the Canadian Shihan Kai in Vancouver, BC. In 2002, Brittany also began training in Ryukyu Kobudo Tesshinkan. She trains with the Bo, Nunchaku, Sai, and Tekko. Brittany received her Shodan (1st Degree Black Belt) in Kobudo and is currently with Ryukyu Kobudo Shimbukan since 2011. Brittany's favorite hobbies are reading and watching Japanese Animation.